Total Kommando is an intense action mod for the already intense downloadable game Soldat. Featuring an array of outlandish yet distinctive weaponry, it has been the staple LAN game of students at the University of Derby's games programming course for a year. Now that it's come together quite nicely, is all balanced and has all the bugs ironed out, we thought it'd be nice to let other people join the action. It's freely downloadable with the complete game in the downloads section. Servers will be hosted on a regular basis in future, and we'll endeavour to keep you up to date with the times and addresses of the servers so that new players may join us! A second version has now been released, featuring a host of fantastic new graphics, and a couple of important gameplay changes. Download it today! 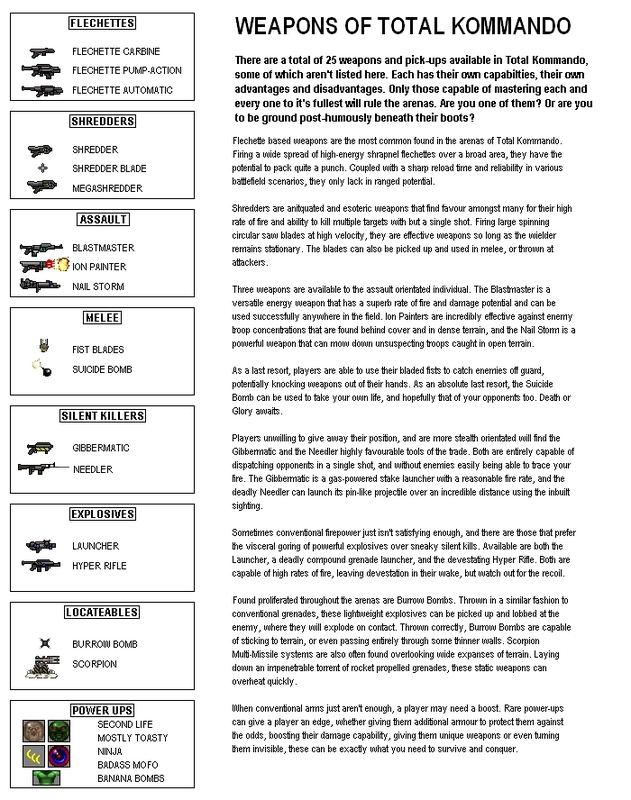 Click here to see an image containing information about most of the weapons and pickups available in the new and improved Total Kommando!